This trio founded in 2000 was named after the first Iberian populated area today known as Zaragoza. Its members, Daniel Francés (violin), Nuria Gañet (cello) and Consuelo Roy (piano) are tenured music teachers in the Conservatories of Music of Tarazona, Alcañiz and Zaragoza respectively. The trio is especially interested in expanding Spanish music. It includes in its program the last two centuries of its repertoire. Its composers carry out an exhaustive search (in Spanish libraries and archives), recovery, study and diffusion of the Spanish musical heritage. Compositions for trios from artists like Antoni Planàs, Mariano Perelló, Pablo Sorozábal, Evaristo Fernández Blanco, Simón Tapia-Colman or José Mª Sanmartín among others have been rediscovered by the audience thanks to the work of this trio. It has performed in different concert series in Spain and Europe such as the ones organized by the Juan March Foundation, the Caixa Catalunya Foundation, the Instituto Cervantes from Palermo, Festival of Ribagorza “Classics on the Border” etc. The trio also performs in prestigious concert halls such as the Auditorium from Zaragoza, the Manual de Falla Concert Hall in the Palace of Longoria in Madrid, the Eutherpe Foundation in Leon, or the Salle Cortot in Paris. In 2003 the trio records a CD in the Auditorium from Zaragoza with the number 1 and 2 trios from Joan Chic. In 2006 they recorded another CD this time with the Montsalvatge Trio and the Evaristo Fernández Blanco Trio. This is a co-production aiming at recovering the musical heritage of the period between the Generation of ‘27 and ‘51. In 2009 the Dramatic Center from Aragón put the trio in charge of the production of a dancing composition called “Delicatessen” which includes choreographies from Amador Castilla, Inmaculada Rubio and Paolo Mohovich. The Salduie trio was responsible for the musical direction, the choice of the repertoire and its interpretation. They performed it in the Convention Center from Huesca, in the Astra Theater from Turin, in the Teatro Principal from Zaragoza etc. Also in 2009 and as part of the work they conduct to search and recover the Spanish musical heritage, they recorded a CD in the Auditorium Eduardo del Pueyo (Zaragoza). This CD is a full compilation of the chamber music for piano from the composer Simón Tapia-Colman native to Aragón. This is also the first recording of such compilation produced in Spain. 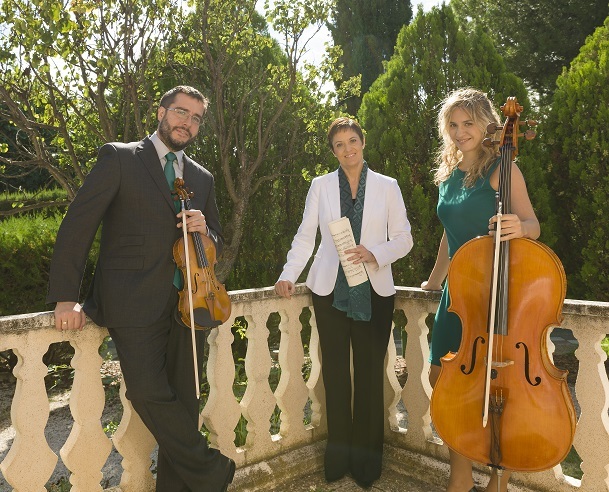 The trio is highly interested in covering the largest possible scope of the repertoire of chamber music and therefore it has worked with several musicians and succeeded in bringing to life complex compositions such as “Las musas de Andalucía” from Joaquín Turina or the newly revised and enlarged version of the “Piano Quintet op. 49 in G minor” from Enrique Granados. Several composers have written for the Trio Salduie. It has performed so far pieces from Joan Chic (number 1 and 2 Trios), Antonio Salanova (Ámbar y azul and Quid ploras? ), Pere Soto (Azar de soñador), David Romero (Unción), Luis Lluciá (Elegía) y Víctor Rebullida (Réquiem Trío). At the moment the trio is collaborating with different artists and Spanish music specialists with the purpose of making Spanish musical heritage accessible to everybody. Moreover it also works with artists specialized in recitation and dancers in order to organize concerts that link music to other artistic fields such as poetry or dance.